Last time, Levi showed Z around his pinball showroom and thoroughly explained the history of pinball. Now its Z's turn to show Levi some of the best pinball video games ever made - to try to convince the world's biggest critic that it CAN be done well. If a man who repairs and sells pinball machines recognizes the merits of a simulation of a real machine, you know it must be good. Games reviewed: Alien Crush (TG-16), Pinball Hall of Fame: Gottlieb Collection (PS2), Pinball FX (xbox live). In other news - if you're gonna be around the NJ area on Saturday - be sure not to miss the NAVA event at Digital Press. 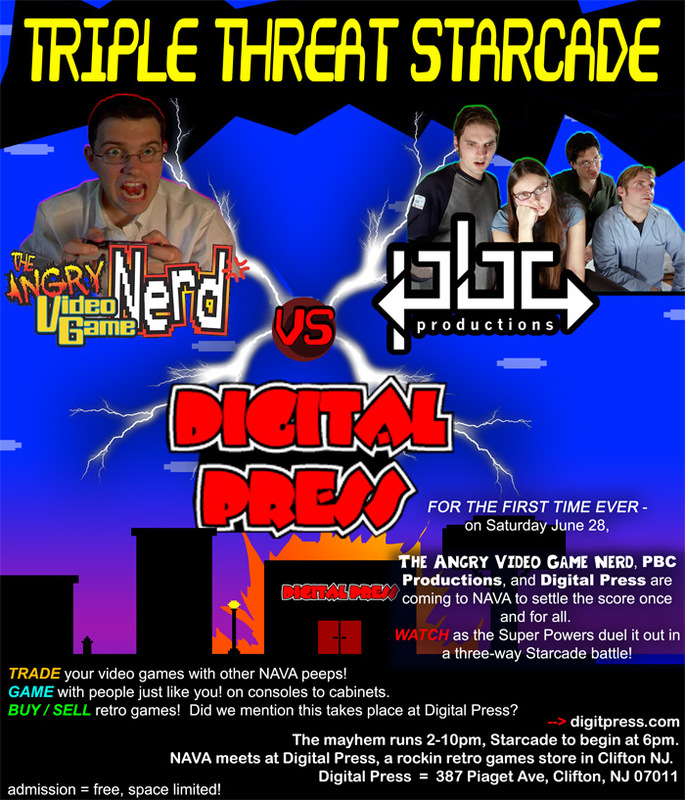 PBC Productions, the cast from Captain S, and the Angry Video Game Nerd are all gonna be there, and it's sure to be an awesome time! If you haven't seen our many forum posts, this month's NAVA is going to be one you dare not miss. We're gearing up the PBC team for a total onslaught - no one knows who will be chosen to represent our side at the Starcade tournament. With AVGN's sheer intimidation bundled with the Digital Press' decades of homebrew experience, the battle looks to be serious. Win-able, but deadly serious. Serious like a 1950s samurai. Serious like a man in a banana costume competing in a Wii tennis tournament...in a bar. click on the above image to enlarge! RIGHT NOW Brett and Darrin are in Texas filming ScrewAttack's 2nd annual Iron Man of Gaming - a gamer festival that spans several days and has cash prizes totaling up to $10,000. If you're reading this and you're at Iron Man, give our boys Hell - especially if they're taking a break to kick back and play some games. To everyone competing: good luck, have fun, and remember - water is your friend. Hydrate! The Barcade in Brooklyn, NY hosted it's second annual Wiimbledon tournament, and PBC was there to document it's greatness. In other news - this weekend the guys from PBC are filming the performances at the O'Neill Puppetry Conference. Woot! 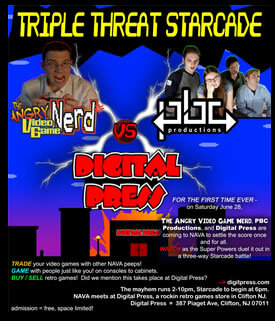 Also - PBC, the Angry Video Game Nerd, and the guys from LIfe in a Game will be having a meetup at Digital Press during the monthly NAVA meeting on Saturday June 28. Come on over, it's a heck of a good time. * - this is a My Little Pony reference.